Mobile poker has always been a popular game on iPhone and Android smartphones. Play for fun apps like Zynga Poker was popular long before the arrival of real-money poker apps from PokerStars and Full Tilt. A growing number of mobile poker sites now offer poker tournaments, Texas Hold'em cash games and speed poker. United States poker players can now play for real money on any iOS, Android, BlackBerry or Windows Phone device. The first poker apps to hit the market offered little more than Texas Hold'em ring games. These days mobile poker sites offer a variety of poker variants, including Omaha Hi/Lo games. Fast fold poker is particularly suited to mobile devices where gamers want to play a few quick hands while they commute or kill time in a queue. 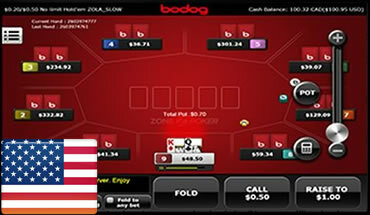 The latest iPhone and Android poker apps now support Sit & Go and scheduled (MTT) tournaments. Bitcoin poker sites are growing in popularity because they can be played anywhere in the world, including the United States. Beginner poker players are well catered for with a growing list of poker tutorial apps that can quickly teach anyone the basics of the game. More advanced players can download poker odds calculator apps that will instantly tell you how strong your hand is. It remains to be seen whether mobile poker software will be developed for wearable devices like Google Glass, Apple Watch and Samsung Galaxy Gear. BetOnline accept real-money gamers from every corner of the planet. Take part in NL Hold'em multi-table tournaments with prize pools of over $100,000 or play regular ring games with buy-ins from as little as 1c/2c. iPhone and iPad players need to play via their Safari browser, while Android users can download the app or use the web-app. Before Bovada removed poker from their website they shifted everything over to Ignition Casino. Playing at the U.S. friendly Ignition poker room is basically the same as playing at the old Bovada site. 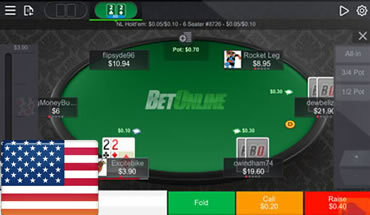 The Ignition HTML5 web-app works on any Windows Phone, Android or iOS device and offers fast fold poker and a variety of ring games to U.S. players. Carbon Pokers real-money United States poker app available. Join our discussion on the new United States friendly real money poker app from Carbon Poker. Carbon Mobile is a web based poker application so you won't find it in Google Play or the Apple App Store. Play Sit and Go tournaments at a variety of speeds or just enjoy regular Texas Hold'em ring games. Join our discussion on the latest Bovada (Bodog outside the USA) real money poker app. Bovada are one of the biggest online poker networks that still accepts players from the United States so it's good news that they've finally released a poker app that is compatible with iOS, Android, BlackBerry and more. Can I play in poker tournaments on my Android phone? Join our discussion on the playing poker tournaments on your Samsung Galaxy, iPhone or Nokia Lumia. Although there are a number of real-money poker apps on the market, very few of them support either Sit & Go or Multi-table tournaments at present. Find out where you can play mobile tourneys. In the 1990's poker transformed from a niche pastime to the fast growing sport on the planet following the arrival of the internet. Poker players no longer had to organize poker nights at their friends houses if they wanted to play a few hands of real-money Texas Hold'em. All they needed to do now was crank up their 56k modem and log-in to PartyPoker or Full Tilt to join a community of players who were ready to gamble 24/7. The game got a further boost thanks to large global tournaments and world tours that were sponsored by online poker rooms like PokerStars. The arrival of late night poker television shows also gave the game the cool factor. Fast-forward 20 years and we can see that poker is once again experiencing a growth in popularity, this time fuelled by the arrival of mobile gaming. Modems and desktop computer have been replaced by cutting-edge devices like the Google Nexus or Motorola Droid, which allow poker player to indulge in their favorite card games anytime they like. The generation who once played Zynga and WSOP poker on their phones have now graduated to playing Texas Hold'em cash games. The USA is one of the biggest markets for online and mobile poker rooms yet it is also one of the most difficult to enter. Extensive lobbying by land based casinos and racetracks resulted in legislation being passed (UIGEA) that prohibited payments processors like banks and credit card companies from accepting payments that were related to online wagering or gambling in the US. This made it extremely difficult for many online poker rooms to operate and forced them to close their doors to U.S. players. Despite this, a number of U.S. friendly poker sites still exist and have released US poker apps that offer both real-money ring games and tournaments. Here are some key points concerning online poker in the United States. Online/mobile poker is NOT BANNED by any federal laws in the United States. Most states DO NOT have any legislation prohibiting its citizens from playing real-money poker either. Poker does not fall under most laws outlawing gambling in the USA because it was deemed to be a game of skill by a federal judge back in 2012. No US online poker player has ever been prosecuted for playing poker either on their PC/Mac or on their phone. In most states it is only illegal for banking institutions to process money for gambling purposes. Playing poker for money still remain perfectly legal. Mobile casino and poker rooms have been legalized in a number of states, including New Jersey and Nevada. On this site we've recommended a number of U.S. facing poker networks (CarbonPoker and Bodog/Bovada) because they've both been in business for well over a decade and are known to be a secure and safe places for US citizens to play. Both poker rooms accept Visa, MasterCard, Bank Transfers, Skrill and many other deposits and cash-out options. They're both fully licensed and regulated by internationally respected gambling bodies, which means your dollars are in safe-hands. You Can't Find Android Poker Apps In Google Play? No problem. Google do not allow gambling apps in Google Play in any country, so it doesn't matter if you live in the United Kingdom, Canada or the US, you still won't be able to download the Android PokerStars app from the Google app marketplace. Some poker rooms like 888 have continued to to developed native Android poker clients, which can be downloaded to your smartphone directly from their website in the form of an apk file that you install. A growing number of Android and iPhone poker sites are choosing to develop their apps as "Instant Play" software which is played from you phones browser. These "Instant Play" web apps work on any browser (Safari, Chrome, IE) and can be played in any country. They don't require Flash either, which means they are also compatible with iOS devices like the Apple iPhone and iPad. Before we recommend any Android poker room to our readers, it must first pass a number of criteria. We ensure that all the Android/iOS poker apps listed on this page have an unblemished reputation for honesty, security and safety, so you can rest easy in the knowledge that your funds are safe. We've also tested them on some less popular Android devices like the Amazon Kindle Fire and HTC One Evo to ensure they are compatible with the widest range of tablets and smartphones. Fast and easy deposits and cash outs/withdrawals are also a necessity before we will give any iPhone or Android poker room our seal of approval.